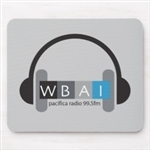 Enjoy your coffee or tea while listening to WBAI with a WBAI logo 11oz mug. This WBAI logo cap has a pre-curved bill, cloth strap and an antique brass slide buckle closure with tuck-in grommet, so it fits well on anyone. and sleeve hems for extra durability.